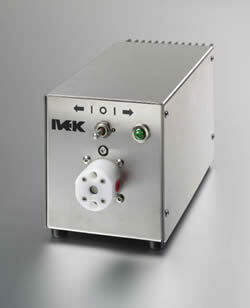 IVEK's Fluid Circulation Module is a self-contained liquid metering system in a compact enclosure. This Fluid Circulation Module has been designed to continuously meter low flow rate repeatable volumes while providing excellent chemical compatibility. The module operates on a stand-alone basis or as an auxiliary unit to an IVEK dispensing system that is performing an application requiring a fluid to be circulated through the gland part of the pump module. Applications that frequently require a gland pump include: clean-in-place (CIP) flushing, cyanoacrylate dispensing, and electrolyte dispensing. The pump displacement mechanism is simple and once set, requires no further operator adjustments. Positive displacement IVEK pumps use ceramic components that offer durability, repeatable displacement and low maintenance. The piston/cylinder set within each pump module is made from high density Alumina ceramic. Each pump module must pass a stringent quality assurance procedure that includes measuring the mated components to 0.254 microns. The specialized matching of these parts is performed in-house and each matched set of piston and cylinder are laser engraved with a serial number. The combination of the ceramic material's physical characteristics of low friction, hardness and stability means that no compliant seals are needed. This eliminates a part that requires frequent replacement in other pump designs.